Jon Holland may have played himself into Test calculations. 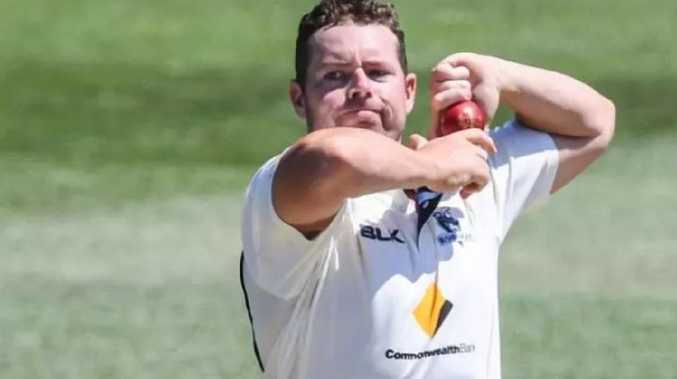 LEFT-ARM spinner Jon Holland has made a play for a return to the Aussie Test team with a nine-wicket haul in the A side's 98-run win over India A in Bengalaru. Victorian Holland, who played two Tests against Sri Lanka in 2016, took 6-81 from 24.3 overs in the home side's second innings to go alongside his figures of 3-89 in India A's first dig. His player-of-the-match display in the four-day fixture is expected to have him in the reckoning for Australia's Test series against Pakistan in the UAE next month. Selected ahead of fellow slow bowlers Ashton Agar and Mitchell Swepson, Holland impressed to help reduce India from 2-106 - as they chased 262 for the win - to be all out for 163 at M Chinnaswamy Stadium. On day three, Travis Head did his selection chances for the UAE tour no harm in compiling a handy 87 as the Australians posted 292 in their second innings. Fellow Test hopeful Usman Khawaja would be well pleased with his returns from the match - 127 and 40. Peter Handscomb failed to put together a score of note in the match, continuing his run of outs in recent times. With wicketkeeper Alex Carey returning to Australia to be home for the birth of his child, Handscomb will take on the extra duties behind the stumps in the second match. Opener Matt Renshaw is understood to be recovering well from his hamstring injury and is on track to be available for selection for the clash that starts on Saturday at the KSCA Cricket Ground.